Well the last 2 days have been interesting to say the least. I had an early start on Friday and was bound for south Essex. When I'm on this journey I always stop for my first latte of the day at Colchester services. I've sometimes spotted a Barn owl here quartering the fields around the services and as I approached the service entrance I started to wonder if the owl was about so I could add it to my list, and low and behold, there silhouetted against the lights of the forecourt was a hovering Barn owl. It then moved off and passed directly in front of me totally oblivious to my presence. This is the problem with this bird. Their eyes are fixed in their head unlike us who have the ability to look up, down, left and right without having to move our heads, coupled with their low flying (rarely 10ft above the ground) they are prone to being hit by traffic. The reason their eyes are fixed is purely for hunting and here's another little interesting fact. The ears of a Barn owl are asymmetrical (not even, one is slightly higher than the other). This enables the owl to locate exactly where a sound is coming from. Now, if you look at an owl's face, you will see it is disc shaped like a satellite. 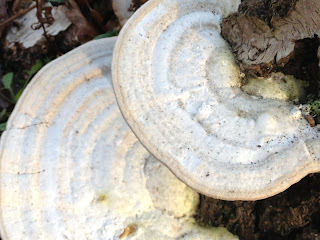 If you look closer, you will see that the disc shape is 'pinched' towards the ears. This directs everything the owl hears towards the ears which in turn causes the owl to turn its head to the direction of the sound. As the owls eyes are fixed, this means the owl is now looking directly at the origin of the sound and as soon as the object moves, the owl will pounce. Usually, the owl strikes with such power, the prey is killed on impact. The next species was another creature of the night, a Fox. 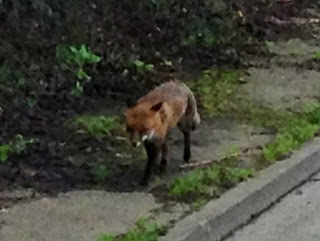 However, this little foxy was walking down the middle of the road towards me in the middle of the day! Vulpes vulpes The daylight Fox. Shortly after this shot came a little birdie in the shape of the Greenfinch, another one of the usual suspects. Now, I have found a little app for my smartphone which helps me identify birds. It has all the basic stuff such as description, photo and calls. However, the call function really comes into its own. Whilst waiting to get loaded, I was parked next to a Sloe bush hedgerow with many little twitterings coming from it. I saw a Chaffinch (already spotted No:6) and wondered what would happen if I played the Chaffinch call from the app. Immediately, the bird which was about 10 foot in front of me flew to the back of the truck. The call played again and this time the bird came back. Each time the call played the bird got closer and closer until I eventually had not one but THREE Chaffinch's within 3 feet of my open cab window looking at me as if I'd kidnapped one of their mates. This app could have its uses me thinks. I tried it out again on a Robin (No:33) which also drew in another Robin and a Redwing. Yay! A new spot :). Today was the work party day with Butterfly Conservation Suffolk at Purdis Heath. This place is an area of heathland that is gradually being encroached upon by Oak and Birch trees which is not good for the Bell and Ling Heather and the Silver Studded Blue butterflies which breed upon them. I arrived early to have a walk around to see what I could spot. First on the list to spot was a Jay with a flash of blue on its wing. Then as I walked along a Gorse hedgerow I saw a little brown flit down low to the ground. I suspected that the little brown flit was the a Wren. Only one way to find out, out with the phone and play the call of a Wren and before the call had finished, there stood on a twig at eye level two foot in front of me was the King of all birds, the Wren! The King??? I hear you say. How can this little bird be a king? Well, are we sitting comfortably? Then let me begin. Once upon a lovely sunny summers morning the Swallows were arriving from their long flight from Africa and they were regaling all the other birds with their stories of their travels. One of which the birds told, involved the Lion, which the Swallows said, was the king of all land animals. At this the Sparrows chirped up and said "Why don't we have a King?" The Crows agreed and said "Yes, we should also have a King, but who? The wise old Barn Owl said "We will choose our King by having a competition. The bird who can fly highest shall be the King of all birds!". Well the first to come forward was the Swallows, then the Magpies and then the Kestral. Then all of a sudden a large taloned yellow foot of the Eagle stepped forward and said "I'll try too". All the other birds stepped back and with no other challengers it looked as if the Eagle had won without even leaving the ground. But all of a sudden, hopping through the legs of the other birds came the Wren saying "Let me try". Well all the birds fell about laughing, but the laughs turned into coughs as with a single beat of his massive wings the Eagle launched into the air leaving behind a cloud of dust. As the Eagle started to climb he looked over his shoulder to see the little Wren emerge from the cloud of dust wings beating frantically. 'This'll be a cinch' though the Eagle as with a few more wing beats he rose higher and higher. Every now and then as the climbed the Eagle would look behind to see the Wren chasing with such fast little flaps. 'This can't go on for much longer' though the Eagle as he climbed up out of the cloud and looking back he could not see the Wren. He waited, but still no sign of the Wren. "So I have soared the highest and therefore am the King of all Birds" the Eagle squawked. "Erm, not quite" said a little voice behind him. Startled, the Eagle turned around to see the little Wren sitting on his back and therefore always being higher than the Eagle. And so it came to be, that the Wren was crowned as the King of All Birds. So, there you go, a little Druids tale about the little Wren, a King. Well we got down to working chopping and lopping down all the sapling trees we could find and then using the cut down trees to build a long, dead wood hedge. This will be very beneficial to the other forms of wildlife that reside on the heath such as reptiles, insects and birds. And this is where the first invertebrates make an appearance on the list. The 7-Spot Ladybird (No:51) and the Purple Hairstreak Butterfly. Now I know that this is only an egg, but it is still a stage in the lifecycle of this butterfly and therefore should be included. These eggs can be found on the tips of Oak tree twigs, just below the bud. They look like little white/greyish eggs and on closer inspection under an eyeglass or microscope the look like little sea urchins. I found these with a little help from my friend Matt of Butterfly Conservation. He had just cut down a substantial oak tree and as these butterflies spend most of their lives n the upper regions of oak trees started to look for the eggs. I joined the search and found some. I was encouraged to take some eggs (still attached to the buds) home to hatch them on my window sill when the time comes (spring, of course). In the mean time, they are sitting in a jar in the fridge and as soon as I get my digital microscope set up I'll post a photo for you. 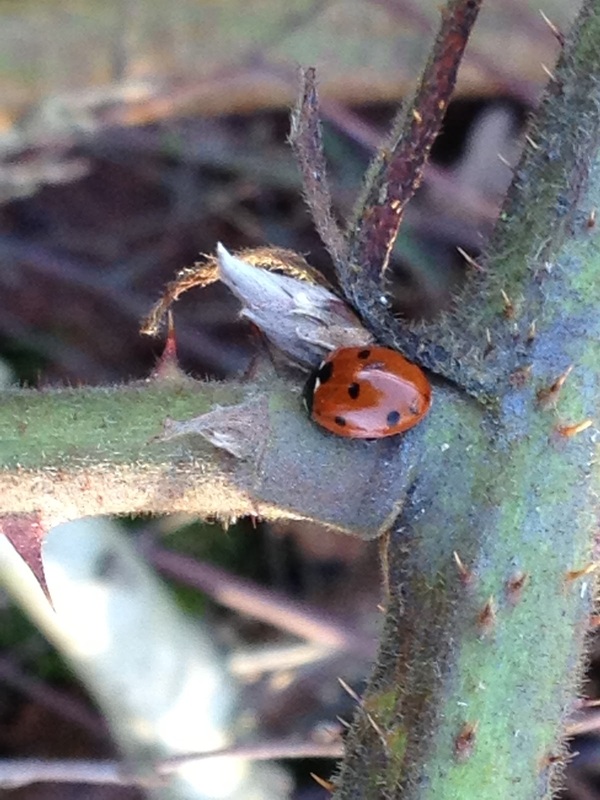 In the meantime, here's the pic of the ladybird. 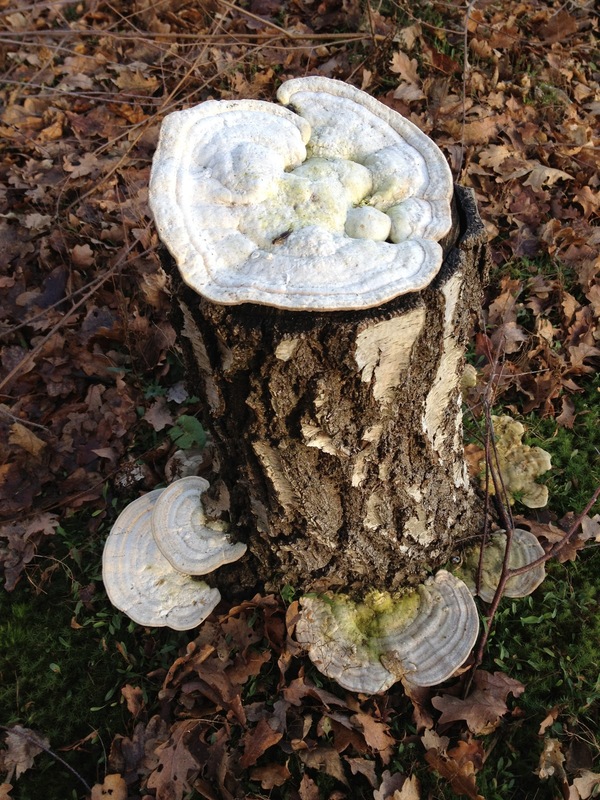 Then, on my way home I came across this wonderful looking bracket fungi on a stump of Birch. As of yet, I don't know the proper latin name for this specimen, but have no fear, I'm working on it. So the last 2 days have been quite productive and has cheered me up. Sometimes I worry when I think I might start falling behind with my list, but on the other hand, when spring kicks in, there should be an abundance of life allowing me to catch up if I fall behind. And I hope to be keeping you up to date with the Purple Hairstreak project. Should be fun, I hope. It seems to be very common on the stumps of felled Birch at Purdis.